It might be Halloween, but Dwight Yorke is already looking towards May, proclaiming “United can win everything this year” in the cover, giving Andy Cole a piggyback. He was hopelessly wrong. United missed out on the League Cup, and had to make do with only the Premier League, FA Cup and European Cup. In news, Gerry Taggart’s hardman image takes a dent after he reveals that he cut short his GAA career as a teenager due to too many bumps and bruises. Teddy Sheringham has just launched his autobiography. He should have waited until the end of the season, he would have had a lot more to write about. 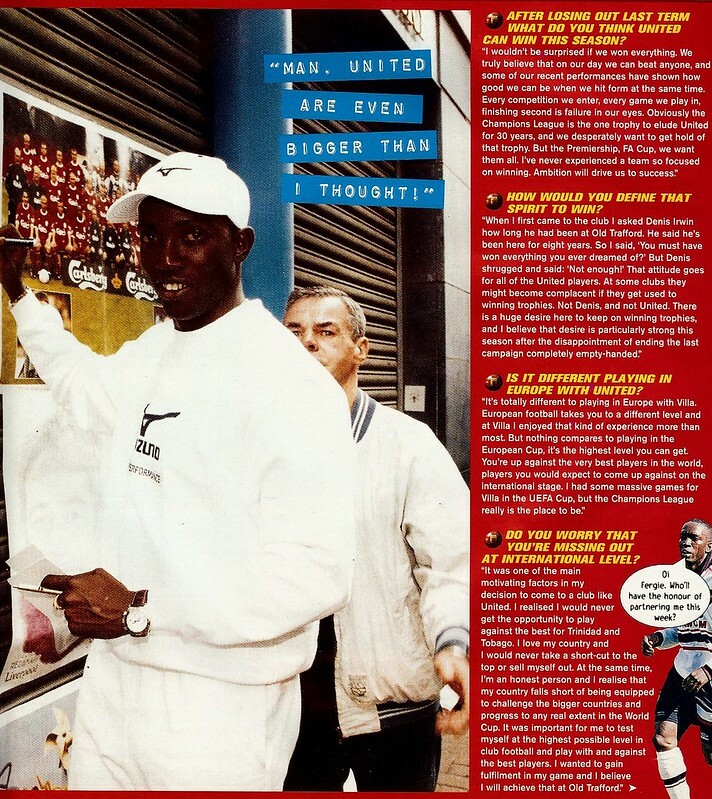 Dwight Yorke’s interview gets four pages, giving an insight into United’s winning mentality when Denis Irwin said he hadn’t won enough medals during his eight years at the club. 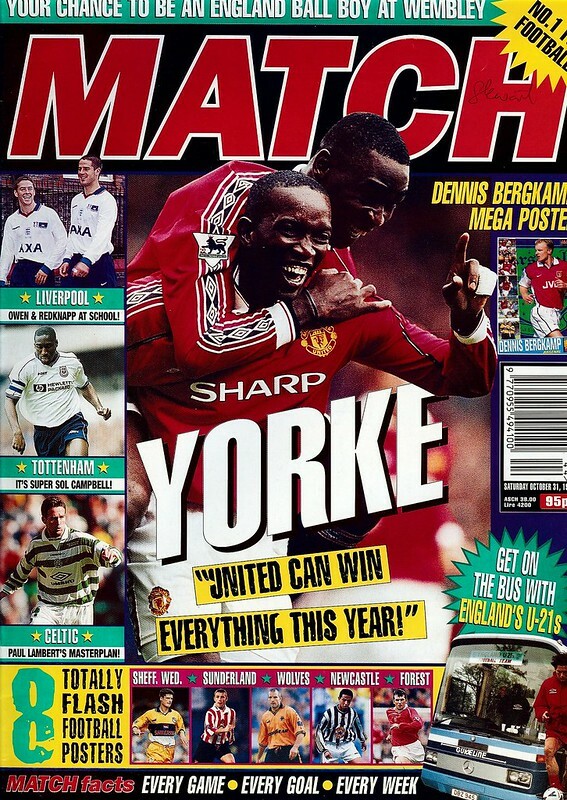 Yorke talks about how glad he is to be playing in the European Cup, and how pleased he is that Aston Villa are doing so well (they were unbeaten and top of the league at this point) without him. 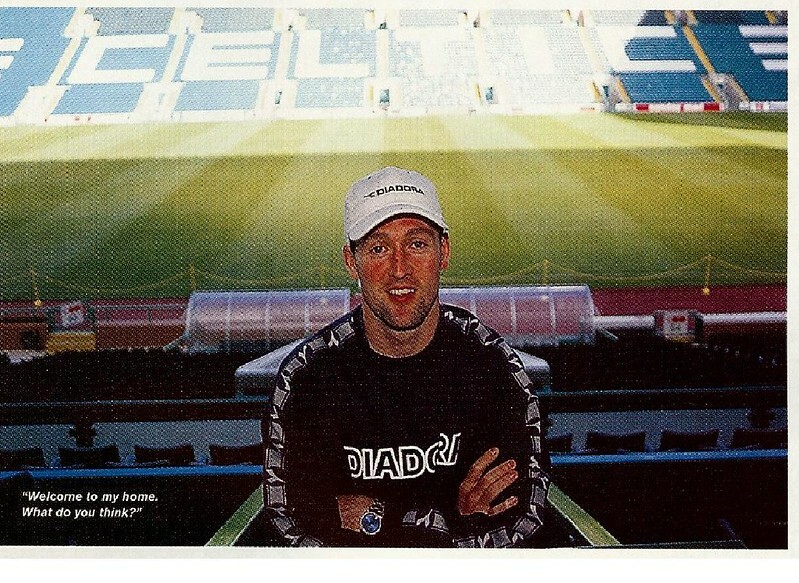 From one former Villa player to the current Villa manager, Paul Lambert does a double page interview defiantly stating that Celtic can retain the SPL despite a poor start to the season. Rangers went on to win the Clean Sweep that season. In competitions, one reader had the chance to be a Ball Kid at the England v Czech Republic game in November 1998. 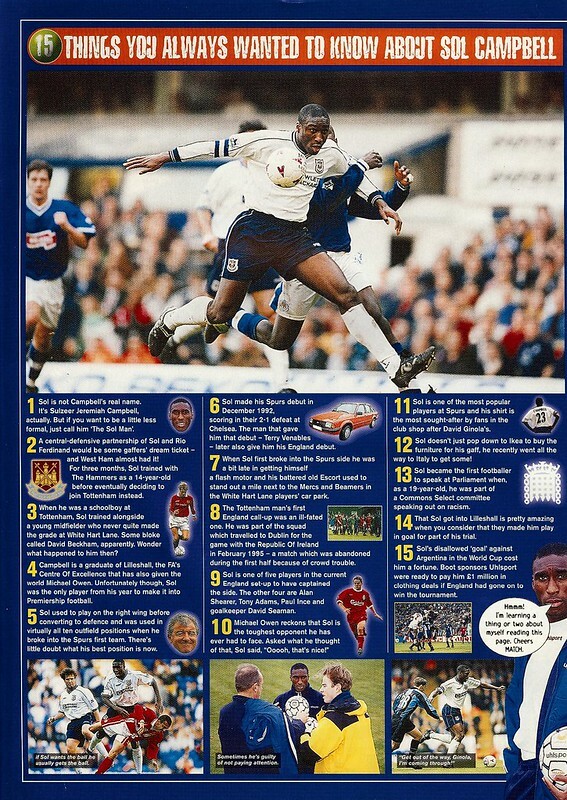 Sol Campbell had just turned 24 at the time of the interview. At the age of 26, he left Tottenham for Arsenal in 2001, and won two league title and two FA Cups. This weekend, is Australia Day. So, as per usual, let’s have a musical celebration. I was in agony at only being able to choose five songs. 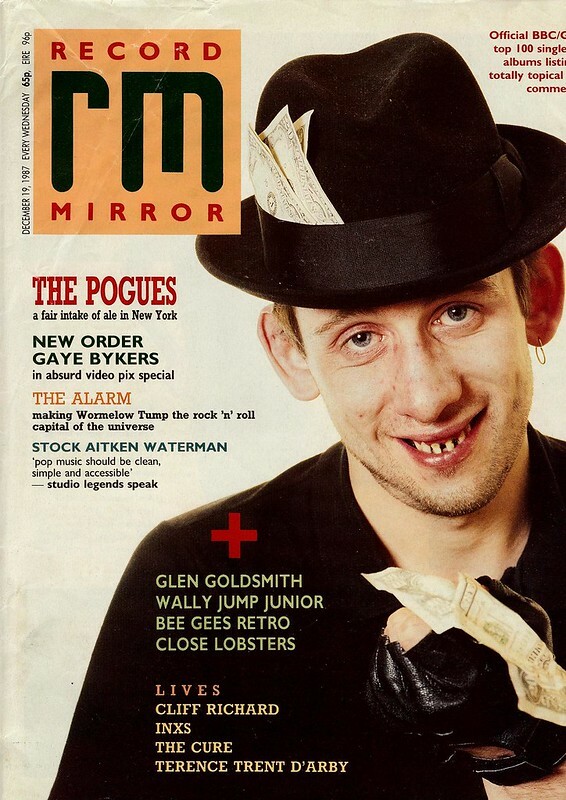 We begin this week by celebrating the birth of a Rolling Stone called Mick, but not that one. Mick Taylor, a Stone from 1969 to 1974, here in one of their last TOTP studio appearances before they became too busy/big for the show, then too low charting. 17th January is a birthday for not 1, not 2, but 3 1980s stars. Paul Young (1956) being introduced here by Simon Le Bon. Meanwhile, three years later (or, 1959) saw the birth of Susanna Hoffs. As a treat, here’s The Bangles performing Eternal Flame in 2001, shortly after Atomic Kitten took a cover of it to Number 1. And finally, in 1964, Andy Rourke. You know, one of the two in The Smiths that wasn’t Johnny Marr or Morrissey. Onto more recent times, Ricky Wilson from Kaiser Chiefs (and, um, The Voice) turns 36 this week. While Calvin Harris turns 31 this week. It’s a busy week for birthdays, with Tom Bailey of Thompson Twins turning 60. Here’s Mike Read introducing them by playing Harmonica. Sir John Mills grandson is 41 this week. You may know him better as the singer from Kula Shaker. Meanwhile, Robert Palmer would have been eligible for a bus pass this week if he was still alive. Here’s a random find of him performing with The Power Station, introduced by Harry Hill. Nicky Wire from the Manics is 45 this week. Here they are performing Everything Must Go. Is it me, or does the drum loop slightly rip off Be My Baby? And Michael Hutchence, who would have been 52 this week. And finally, being introduced by his ex, Kylie Minogue in 1997, the year he later died. Almost near the end of this week’s Birthday Bonanza, one last one, Andrew Roachford, or just plain Roachford. Though, you can’t hear ‘Cuddly Toy’ without thinking about this. And finally, we end on a sad note, as this week saw the 18th anniversary of the death of the London Boys. This song, is just fantastic. Double blog time. Didn’t have the time to blog about the Crusaders game in midweek, then left it too late for it to be a standalone blog. Left Windsor Park frustrated with the draw, for a number of reasons. Obviously the result, combined with Cliftonville’s win, meaning the defecit was reduced to 1 point. It maybe might not have felt so bad if Linfield had already played and won their game in hand and led by 4. Even more frustrating was the manner of the draw, in the lead, looking comfortable, then a shocking goalkeeping error in first-half stoppage time. The half-time whistle blew as soon as the game restarted. Even worse, Crusaders were there for the taking, and we didn’t take them. Even worse, Ivan Sproule wasn’t utilised properly. He’s a pace player who creates opportunities. It is so glaringly obvious. So, today, I headed to Ballymena, hoping that Linfield could get back into winning ways. There was a familiar face in the opposition in the shape of Jim Ervin, who recently moved to Ballymena. A great servant to Linfield, sadly the time was right for him to be moved on. I’m please for him that he’s got a move to a top flight club, and at 28, is young enough to still be playing at that level for a few more years. It’s a ground we’ll have at least one more visit to this season, for the County Antrim Shield Final. A lot can happen between now and early March, but if the game was being played next week, I wouldn’t bother. I’ll wait and see how I feel at the time. Ballymena started the game well and had the better of things, without any clear opportunities, though Jonathan Tuffey was forced into a top class close range save from Darren Boyce. In the second-half of the first-half, Linfield came more into it, creating more opportunities, the best of which came when Philip Lowry shot wide, albeit from a wide position in the penalty area. As it happened, Ballymena scored when Linfield were having their best period of play, a shot well saved by Tuffey which fell for Alan Teggart to fire home from the edge of the box. Frustrating, especially that Linfield only turned up from 25 minutes onwards. The second-half began with Linfield going for it but being met by Ballymena resistance. A couple of minutes into the second-half, the momentum changed, when Ballymena’s Tony Kane was sent-off for a second yellow card. However, given Linfield’s inability to break down ten men sides Glentoran (albeit, it was 10 v 10) and Crusaders (twice), the win was far from guaranteed. You got the feeling, Linfield needed a goal within 15 minutes. With each passing minute, Ballymena’s resistance would get stronger and stronger. The goal came, Philip Lowry header from an Andrew Waterworth cross, on 61 minutes. Now, the momentum had truly swung in Linfield’s favour. The goal underline what Waterworth has brought to Linfield this season. It’s not just his goals, it’s the fact he makes things happen. He’s the sort of player who could go five games without a goal without anyone noticing. Linfield rammed up the pressure, and were rewarded five minutes later when a Michael Gault free-kick fell to Jamie Mulgrew, who fired home. And after that, Linfield still attack, but couldn’t get a 3rd goal. Despite the fact that Ballymena’s attcking threat was mostly nullified, 2-1 is still a slender lead with too much margin for error. Ballymena had their moments towards the end of the game, but Linfield held firm throughout the five minutes on injury time, ironically due to Ballymena’s ridiculous timewasting when the score was 1-0. Shouldn’t really complain about the correct amount of injury time being awarded, even though Ballymena players made a mug out of the ref the whole game with the amount of time they took at set pieces, especially goal kicks. More of a bonus, was Cliftonville and Crusaders dropping points today, meaning Linfield are now 4 points clear with a game in hand. In the context of two games, we’ve gained a point and are two games closer to the end of the season. Got to be happy with that. With Cliftonville and Crusaders not playing in the league next weekend, getting a win at home to Ards next week becomes so important, in order to get our biggest lead of the season, at such a vital stage. I’d remarked to a friend at Warrenpoint that the run of Glenavon-Warrenpoint-Crusaders-Ballymena-Ards-Cliftonville at the start of 2014 would define the season. A return of 4 wins and 2 draws at least would set Linfield up for the run-in in Spring. As it stands, Linfield are on course for that. The key game, is at Solitude on 1st February. Going to that game (getting my ticket at the Ards game) mainly as i’ll be in London the weekend after and would be going three weeks without a game. Hopefully, we’ll turn up and put in a performance. If we beat Ards, we’ll go into that with a massive lead, and a chance to kill off Cliftonville’s title defence. The same situation as the game in November. Hopefully, Linfield will right the wrong of the non performance that day, and right the wrong of the Gibson Cup not being at Windsor Park. We begin this week with John Peel playing Mandolin and Football at the same time. I imagine you’ve already guessed who turned 69 this week. Like Top Of The Pops, Brad Roberts of Crash Test Dummies was born in 1964. It took him 30 years, but eventually he got to appear on Top Of The Pops. Also celebrating a birthday on 10th January is Vicky Peterson of The Bangles. One of their biggest hits was written by a gentleman called Christopher Nevermind. Who? I hear you ask. It was Prince under an assumed name. And now, rewind to 1991, Roxette (It’s Per Gessle’s birthday) performing Joyride. Remember, we are all magic friends. Incidentally, that was the year Pixie Lott was born, and in a tenuous link that any TOTP presenter would be proud of ……. This week is the 11th anniversary of the death of Maurice Gibb. Born on Isle Of Man and growing up Manchester made the Bee Gees Manx Mancs. 53 this week, Suggs might be known to some as the guy from Night Fever, but to many more, he’ll be known as the guy from Madness. 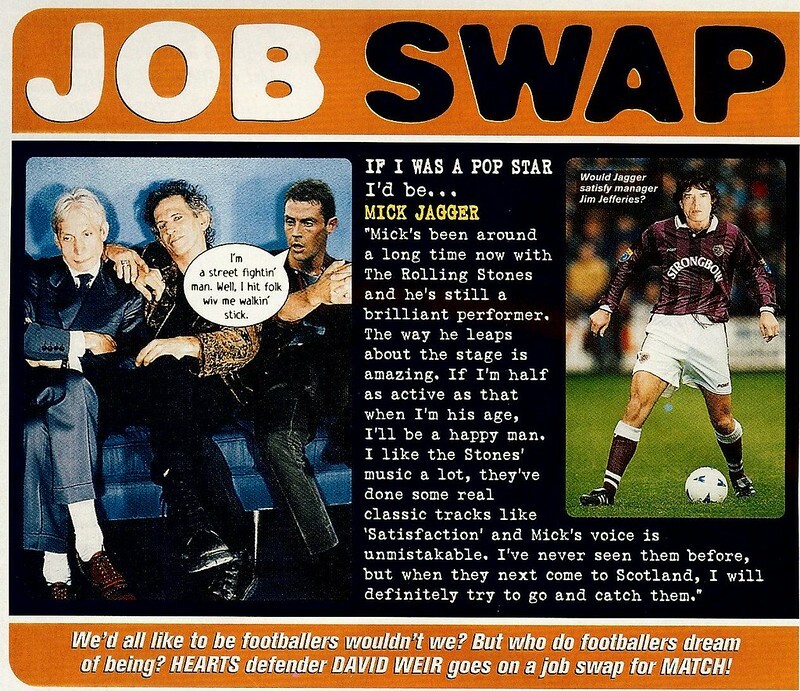 He was also one of the captains on A Question Of Pop, a music version of a Question Of Sport. 13 years on, we’re still waiting for a second series. He also had a briefly successful solo career you know. Meanwhile, someone has went to the effort of doing a montage of all of Madness TOTP appearances. Madness split up before I started school, so imagine how excited I was when they made a comeback in 1999. 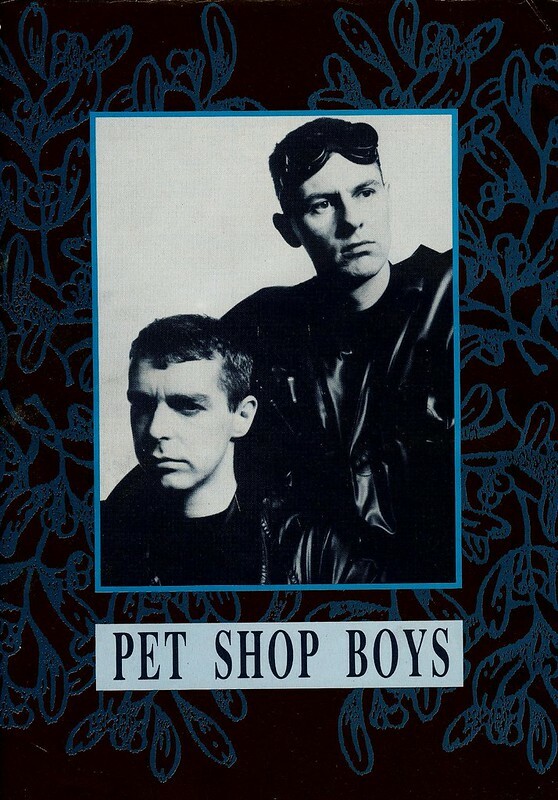 The lead single of their comeback, Lovestruck is fantastic, classic Madness. Remember Calvin and Frankie from S Club Juniors? Well, you’ll never guess what Frankie did next ….. Meanwhile, Aaliyah would have been 35 this week. Here she is performing Try Again a year before her death. Another singer born this week in history is Preston, erm, from The Ordinary Boys. I used to like them before he went on Big Brother.